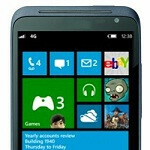 Is the HTC Titan III a yet to be announced Windows Phone? 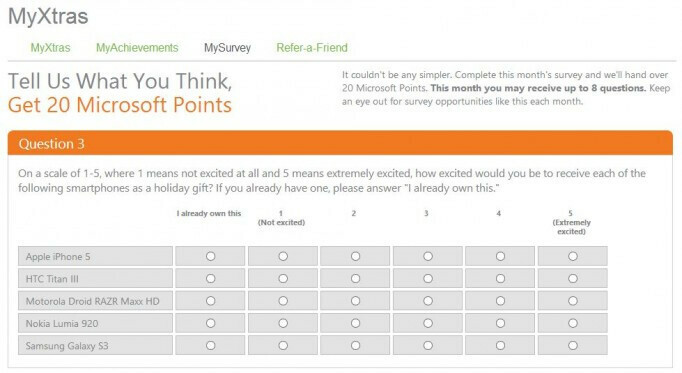 File this in the “pure speculation folder,” but an Xbox Live Rewards survey started the conjecture. Every month, participants in the Xbox Live Rewards program get a survey from Microsoft which allows them to earn points which may be redeemed for goodies down the road. Something odd appeared in December’s survey. On question 3 which asks the user how excited he or she may be to receive any of a list of smartphones. On that list is the Apple iPhone 5, Motoroloa Droid RAZR MAXX HD, Nokia Lumia 920, Samsung Galaxy S3 and the HTC Titan III. HTC Titan III? Back in June, we caught word about a leaked Windows Phone device roadmap from HTC. On that list was the HTC 8S, code named Rio, the Accord which is the Windows Phone 8X, and the Zenith. The Zenith was thought to be the upper scale model of the bunch, featuring a 4.7-inch 720p Super LCD 2 screen, 8MP camera, and a top-end Qualcomm processor, rumored at the time to be a quad-core unit. Word was that the Zenith would be available by Christmas. Since we have not seen a trace of this device in any way shape or form, and no mention of it was made at the Windows Phone 8 event in San Francisco, we will safely assume that the survey reference was merely a typo and the survey option should have read the "HTC 8X" or something. Perhaps the device was shelved or never existed. Besides, all the Windows Phone 8 devices run the same dual-core processor. We could speculate all sorts of ideas, but instead we will let you determine your own fantasy. So, if you were to read between the lines, what would you think about the idea of a sequel to the HTC Titan II? Is it a typo, or will HTC surprise us with a new Windows Phone? add imagesense to that wide angle front facing camera and that 16mp sensor on the titan, with that 1080p super LCD 3 display - i could be sold ---- with the Windows Phone 8X design or something. yeah.. dreaming on. I remember the Titans having that 480 x 800 screen that sucked on the large size. @android fans/trolls: WP8 can take the same specs as Android, as evidenced by the WP8 models. Titan3 will likely be a rebodied OneX+ runnings WP8, with the same 4.7ish" screen to rival the ATIV S (4.8, since it is a rebodied GS3). The major OEMs who do both WP and Android will just pop the different OS on there, maybe change the body a bit (colors for WP, more likely than not), and let it go from there. It's great. Level playing field, no sacrifices for either OS from a hardware level. Well, except arguably cameras for Android, since only Sony seems intent on giving Nokia a decent argument in the camera department. So I'll revise my prior statement: no sacrifices for the running gear for either OS. Same processors, same RAM capability, both have MicroSD support. WP8 has even more longevity built-in to it, if we're honest, since it's made to take up to 64-core processors. I think Android 4.2 maxes at 8, but no OEM has done more than 4 since the software and apps couldn't really use them, they're not market-ready, and are battery hogs. Well, what I say is exactly what I heard from WP camp as they justified low specs of L900 and current WP8. You are right about same hardware for some Android and WP8 phones, but we know that GS3 is 6 months old and newest top Android phones all have best CPU while WP8 phones have OG CPUs. Now Android phones are moving to 1080p and 8-core CPU and we don't know when WP8 can do the same. We shall not forget that only Nokia and HTC have released WP8 phones and others are not enthusiastic at all. One small correction: 8 core CPU will save battery with BIG.little architecture. 8 core CPU? Do you mind giving us the source of that "info"? AFAIK next year will be the quad Cortex A-15 year. Nothing is confirmed yet, I think the 8 core CPU are still being designed. But ARM has announced BIG.little architecture and there are various reports about 8-core CPUs from SS, ZTE, LG... You can find some on PA or you can google to find the reports. I think for 1H 2013 Krait quad core and A15 quad core CPU will dominate, and we may see 8-core CPU in the 2H which will be used with Key Lime Pie. MeoCao hit it exactly right, so no further explanation needed for the 8-core stuff. As for WP9, that will likely be years down the road, as, so far, Microsoft has had incremental partial-version updates, like NoDo, 7.5 Mango, Tango, and 7.8 which is TBR early next year. I really appreciate that a lot because it gives the sense that devices will be supported for a decently long lifespan, especially since all the /mainstream/ Windows 7 and 7.5 phones are getting 7.8, so it'll be the rough equivalent of going from FroYo to Jelly Bean 4.1 (not 4.2 or whatever the K-series will be) since that is the one just behind the current main version, 8. We will still see frequent replacements (6-month-ish cycle most likely given the changes from Focus to Focus S to Focus 2, as well as Lumia 710/800 to 900 and now 820/10/22 and 920), and with both Samsung and HTC in the game it wouldn't surprise me -in fact I expect- WP8 versions of the Droid DNA, OneX+, and GS4, and probably even the Note series. They've been doing it since the Windows MOBILE days, no reason to stop now. Cheaper for them, better for us. This is where I believe MS has made fatal mistake. The timing of WP8 put WP8 phones directly against competition which have better specs, so many ppl think WP8 brand is inferior to competition and WP8 devices do not have any time at all to take foothold. if WP8 phones try to compete directly against Android and iPhone even with the same specs they're still in disadvantage as they are new brand and still have lots to prove to consumers. So we can imagine what will happen when WP devices have lower specs. Calm down windows fan boy lol I never said WM8 cant support or handle it. What I said was Microsoft wont allow it until WM9. If you haven't seen their trend they follow they make almost all of the devices have the same or similar specs. They wont allow 1080p until WM9. And I have been using my Note 2 with heavy use for 14 hours and still hsve 39 percent battery, im good thanks. Note2 is a quad-core with a big battery, and 4.1/4.2 has optimizations for quad-core, so if you had anything less than what you have I would be disappointed. My reference was to the octo-cores which aren't close to market (but can be enabled with the right equipment for the development emulators, but doesn't make a tangible difference for most tasks and apps. The awesome thing is, WP8 is already optimized to run up to 64 cores. Oh? It only took one major revision to do that too. How long did it take Android you say? 4 major revisions? Goodness. People who want 1080p in their phones are the people who think bigger means better. 720p is good enough thanks. Before we know it, our phones will have 4k screens. Buyers don't care about that, what they see is Android phones have last gen CPUs while WP8 phones have OG CPUs. Mismatch between hardware and software infact makes WP8 files very big unneccessarily and take lots of precious memory. Ahaha, no. W8 supports up to 64 cores, not WP8 ! Ahaha, yes. "Windows Phone 8 is the first mobile OS from Microsoft to use the Windows NT kernel, which is the same kernel that runs Windows 8. The operating system adds improved file system, drivers, network stack, security components, media and graphics support. Using the NT kernel, Windows Phone can now support multi-core CPUs of up to 64 cores, as well as 1280x720 and 1280x768 resolutions, in addition to the base 800x480 resolution already available on Windows Phone 7. Furthermore, Windows Phone 8 also adds support for MicroSD cards, which are commonly used to add extra storage to phones." Samsung or other OEM's like HTC or ZTE should launch phablet like device for WP8. It would be a very good device, and it will work very nicely on WP8 with stylus. I think samsung should launch Note 2 type device for WP8. I think HTC should launch a Titan III cause there is no Wp8 in the market which has a big screen than 8x.. Titan III may come next year..
8X (and 820/22/10) has a 4.3", 920 has 4.5", and ATIV S has 4.8". Check again.